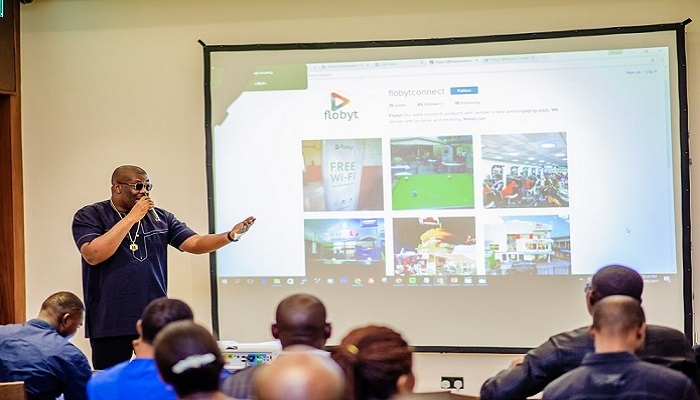 Flobyt WiFi, a new WiFi service that lets Nigerians have access to free internet service has been launched last week. The free WiFi service is co-founded by Mavin Records CEO Don Jazzy and Dele Odufuye CEO of Tsaboin and the unveiling of the initiative was held at Renaissance Hotel in Lagos. Flobyt is a free WiFi service installed across partner locations in Lagos like eateries, parks, taxis, buses, restaurants, cafés and many other businesses. The service is free for patrons of a business who wish to access the internet while in the premises of the patron locations. Flobyt is not the first attempt at a free WiFi solution in Nigeria. There is Airtel’s Free basic and ExpressWifi internet service provided by Mark Zuckerberg as well as ntel free WiFi that gives you access to unlimited download, live streaming, and browsing on all ntel compatible device. Don Jazzy enthused over the solution with much optimism. He hinted at a few tech investments, stating that Flobyt was not his only investment in 2017, but that he had incredible confidence in it. Businesses and users can nominate their location to be hosts free of charge to Flobyt WiFi by filling out a form on the website. For small business owners, the basic Flybot WiFi router currently installed in various locations across Lagos mainland and island and can accommodate 10 – 30 users at a time will serve perfectly while locations with higher traffic, Flobyt Max can take up to 80 concurrent users at one time. The internet router itself is a plug-and-play device that, according to the founders, does not require much technical know-how to operate. There is no charge to use Flobyt WiFi, all it takes is to walk into a partner outlet, patronize them, and use the internet without restrictions. Free WiFi in a public place is not the safest avenue to share your private and personal information. On security concerns, Dele said security protocols were in place for regular authentication and automatic disconnection of any potential hacker. The company plans to take its services to other parts of Nigeria, through West Africa and ultimately throughout Africa giving the public access to free internet while providing value for the business owners.